Now that you have a general idea of the value vCenter Operations Manager can provide, let’s look at the customizations that are available in the adapter for VMware View. To install the adapter for View, you need to complete several steps. The first one is to install the adapter on a server. 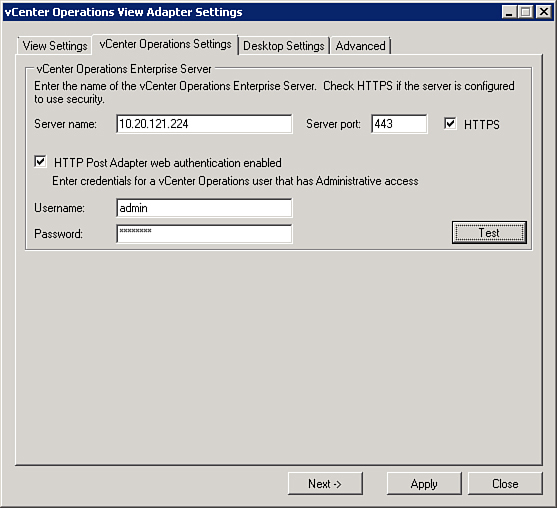 The vCenter Operations View Adapter supports Windows 2003 or 2008 R2 server. 1. Run Server Manager from a Windows 2008 R2 Server. 2. Right-click the Features module and select Add Feature (or run Add Feature from the Action Panel). 3. Select Windows PowerShell Integrated Scripting Environment and click Next. 1. 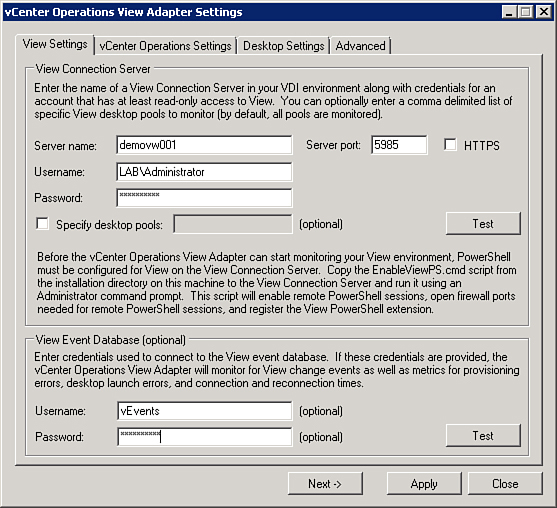 Launch the vCenter Operations Manager for View installation. 3. Click Next on the End User Patent Agreement screen. 4. Accept the license terms and click Next. 5. You can change the default installation path; otherwise, accept the defaults and click Next. 6. Select the box to automatically start the VMware vCenter Operations Manager for View Configuration tool and click Install. After you have enabled the Windows Remote Management Listener, you can configure the adapter. 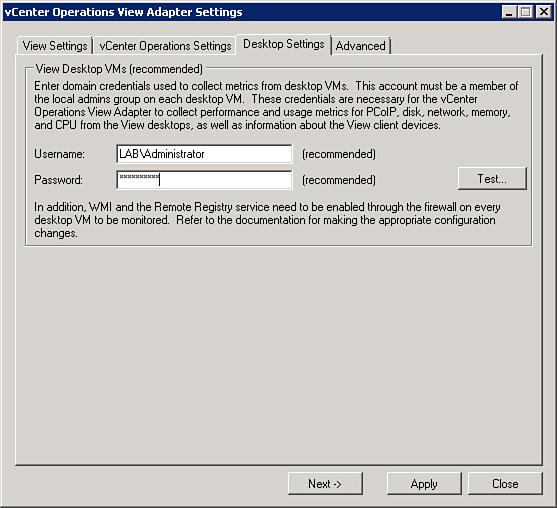 On the first tab of the adapter configuration, set up the connection to the View Connection Server. You need to specify the server name and account that has access. You can test the connection by clicking Test. You can also monitor change events and provisioning errors by configuring a connection to the View Event database. Configure the connection and click Test. Configure the settings and click Apply (see Figure 26). On the next tab, you configure connectivity to your vCenter Operations Server, which is actually the UI virtual appliance. This step is very confusing because the username in this section is the vCOPs admin user even though it requests a user with administrative access. It does not work with any other account but the admin user. Configure the settings and click Apply (see Figure 27). Figure 27. Specify vCOPs user. To view the logs on the virtual desktops, you need to provide a domain account and administrator credentials to the desktop. This way, the adapter can collect performance metrics for PCoIP and disk, memory network, and CPU information. Configure the account and click Apply (see Figure 28). Figure 28. User with administrator access to desktops. On the Advanced tab, you can set the level of logging, the frequency of collection based on the size of the environment, and the number of CPU threads used for collection. In addition, you can start the service. Start the service and click Apply (see Figure 29). Figure 29. Set the logging level.